Quite suddenly industry insiders, analysts and media are recasting beleaguered “car rental” plays into lucrative “fleet management” plays, CRUCIAL to the futures of Uber/Lyft. Icahn owns 35% of HTZ and is major Lyft investor. Icahn paying huge premiums to acquire additional targets across rental, ride share, service and parts. “Vehicles As A Service”. Short interest at HTZ just hit 61.9% of float. 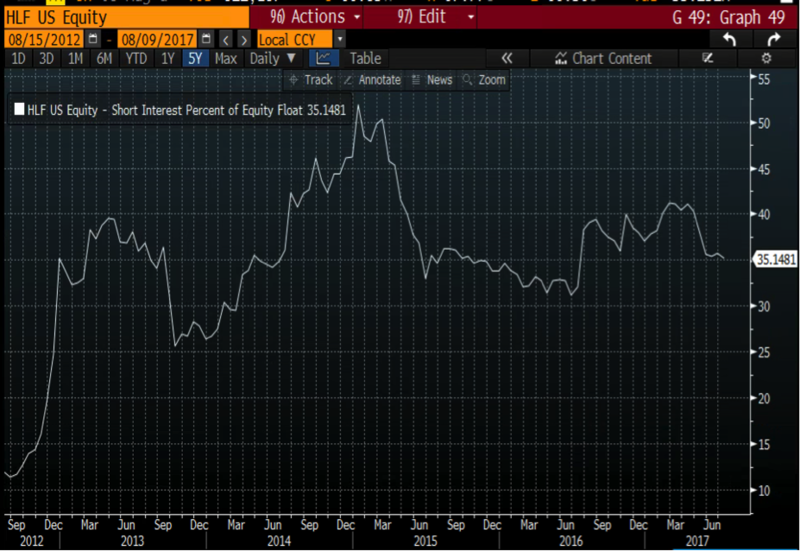 Short interest now EXCEEDS effective float by millions of shares. Not enough shares for shorts to readily cover. As we saw with RH and WTW, shares of highly levered and heavily shorted stocks can quickly triple when even a very mediocre improvement changes the bear thesis. With Herbalife, Icahn has shown that he iswilling and able to play and benefit from a short squeeze. Icahn is now showing a paper profit onHerbalife of $500 million. Note: This article is the opinion of the author. The author is long HTZ. On Tuesday, Hertz Inc (HTZ) released Q2 results. As expected, the numbers were grim as ride hailing services continue to steal customers and revenues from traditional car rental companies. On the conference call, newly installed CEO Kathryn Marinello was making an obvious effort to “under promise, then over deliver”, in sharp contrast to multiple years of unfulfilled hype from her predecessors. Also on Tuesday, Uber announced that it would be terminating its car leasing program which was providing cars to Uber drivers with poor credit. The announcement highlights the need for “transport tech” leaders (including ride hailing and autonomous tech) to focus on what they are good at (i.e. the technology, not the vehicle management). It’s not just that Uber was losing tons of money on this program. The real crisis was the Uber actually had no idea how much money they were actually losing. Uber was originally estimating that losses were running about $500 per car. Instead, the real number was roughly $9,000 per car! This is why Uber, Lyft, and Apple are already scaling up their programs to use Hertz vehicles and let Hertz handle the fleet management. Apple, Google, Uber and Lyft have been pouring billions into their quest for ride hailing and autonomous vehicles. Uber alone is on track to lose $3 billion just in 2017 alone. Multi billion dollar losses are just the price of admission into this burgeoning market. Yet none of these players has any appetite to undertake the ownership, management, repair and logistics of fleet management. As these giants jockey for position in this transportation gold rush, Carl Icahn is aggressively pursuing the strategy of “selling shovels to the gold miners”. In various public statements, Icahn has made it very clear that there is a new paradigm shift in how people are getting from one place to another. Icahn is clearly NOT betting that the current car rental model is going to rebound in its current form. Instead, Icahn is building a nationwide “Vehicles as a Service” (“VaaS”) platform with Hertz (HTZ) at its core. The purpose is to provide fleets and fleet management to the new transportation providers in ride hailing and autonomous vehicles. Even as Hertz’s share price was plunging to new lows, Icahn more than doubled his stake, buying 16 million more shares at an average of $23.78 in November. Icahn now owns 35% of Hertz. Over the past 3 years, Icahn has been spending billions, paying huge premiums to snap up numerous other companies from all parts of the fleet management spectrum, including: car rental (fleet management), ride hailing, auto parts and auto servicing. The headlines over the past 3 years illustrate Icahn’s “Vehicles as a Service” strategy centered around Hertz . May 18, 2015 Multiple What’s up with Carl Icahn’s sudden car obsession? Ultimately, Icahn’s VaaS strategy means that whichever emerging technology wins out in the next few years, Ichan (and Hertz) will be poised to be the most comprehensive and integrated provider of fleets and fleet management. So rather than being defeated by ride hailing apps such as Uber and Lyft, Icahn is positioning Hertz to be the key service provider to BENEFIT from the rise of Uber and Lyft. In just the past two weeks we have started seeing industry journals, sell side reports and mainstream media articles which are doing a 180 degree pivot on the outlook for car rental (now known as “fleet management”) providers. Details of these reports and articles are included below. This new (and more forward looking) thesis is a radical reversal from the draconian extinction thesis which has led Wall Street to place massive short bets against Hertz. But the extended negative sentiment has already pushed Hertz’s share price down by 90% in 3 years. The most recent “Sell” rating (from Barclays) sent Hertz tumbling by 30% in two days on massive volume. Short interest currently sits at 61.9%. But in fact it is actually much worse than this. 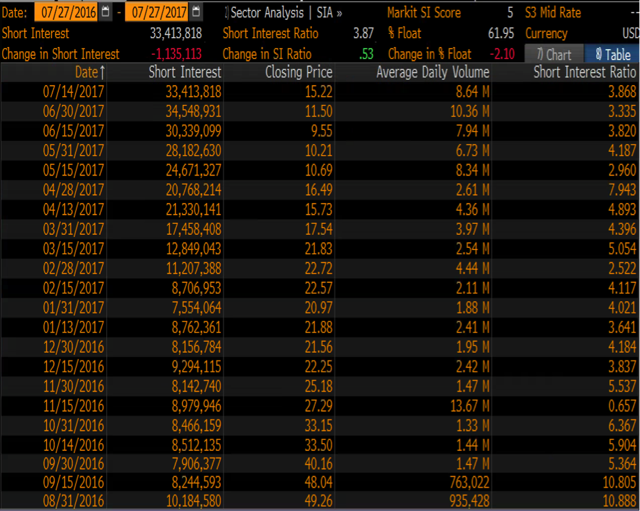 Beyond the stated short interest on Bloomberg, the true effective float has shrunk to just 22.3 million shares vs. a current 33.4 million shares short. There are simply not enough shares to allow shorts to readily cover. This math and its components are illustrated below. So how is the bear thesis suddenly changing? The severe bear thesis has two components, both of which are quite obvious. First, it is assumed that ride hailing companies (Uber/Lyft) will simply put the rental companies out of business by stealing passengers and revenues. Second, it is assumed that rental companies will be severely impacted by a glutted used car market when they attempt to sell their car inventory. This has been a very visible phenomenon over each of the past few quarters (including the just announced Q2). Passengers will still be using Uber and Lyft to book rides which are fast, flexible and convenient. But they will be increasingly riding in a Hertz car. Following his initial investment in Hertz, Icahn invested $100 million in Lyft. Shortly thereafter, Lyft began a program where Lyft now pays up to 90% of the cost for its drivers to rent cars from Hertz, rather than driving their own cars. This allows drivers flexible use of a vehicle whenever they want at almost no cost and with zero responsibility for depreciation or maintenance as long as their rider targets are met. Shortly thereafter, Hertz began a different program to rent cars to Uber drivers as well. Now that Uber has terminated its own leasing program, it will need to figure out a quick and easy substitute (such as Hertz). When you re-listen to the Q2 conference call, you will hear that there has been a very steep increase in ride hailing rentals, up from nearly nothing a year ago. Virtually no attention was given to this development on the call. Furthermore, as Apple, Google, Uber and Lyft seek to eventually eliminate drivers completely by using autonomous vehicles, their need for fleet management becomes even more critical (because there will be no more drivers to supply their own cars). Autonomous vehicles are still a few years away. But even as these programs develop in the test phase, they will need fleets of thousands of vehicles across the country. By providing the cars to Uber and Lyft, Hertz will increasingly be able to claw back a substantial portion of the revenues which would otherwise be lostas passengers shift towards Uber/Lyft rather than renting their own cars. Yes, these revenues are lower margin that corporate customers. But they allow Hertz to get marginal revenue from cars which would otherwise be sitting idle. Second, it also means that Hertz can greatly extend the useable life of its car inventory rather than being forced to dump its inventory at distressed prices into a glutted used car market. “Car rental” customers typically expect a car that is brand new or perhaps one to two years old. But both Uber and Lyft allow their drivers to use cars in good condition which are more than 10 years old. Hertz is already in the late stages of “right sizing” its fleet. Once this is done, the pain from inventory sales should get significant relief going forward. And as we will see, the Hertz programs with Lyft and Uber are just one element of Icahn’s much wider assembly of fleet management via his VaaS acquisitions. With Hertz trading down by more than 90% in 3 years, Ichan is now conceivably in a position to acquire the remainder of Hertz outright. The remaining 65% of Hertz’s equity is now valued at just $700 million. Alternatively, each of Apple, Google, Uber and Lyft are now so enormous that they could easily take a $300+ million stake in Hertz just to secure their future access to the fleet management. Such an investment would be tiny for any of them. In the past, Icahn has repeatedly taken large stakes in out-of-favor companies which were highly levered and heavily shorted. When his investment reduces the outstanding float of the heavily shorted stock, the supply and demand imbalance causes the shares to rise almost automatically. As Icahn repeatedly increased his stakes in embattled (and heavily shorted) Herbalife (HLF), that stock rose by 70-100% from the time of his initial investment. As with Herbalife, Icahn started small and then made a large increase in his stake. Also like Herbalife, Icahn obtained substantial influence over Hertz via multiple board seats. Hertz is highly levered. Even just a mediocre re-rate of its business prospects (just a slight boost to enterprise value) will result in a massive spike in the equity value. The high short interest will then further turbo charge that rise. But, in fact, judging by the significant shift among sell side and mainstream media sources, we could be due for a re-rate that is much larger than just “mediocre”. During 1H 2017, shares of Restoration Hardware and Weight Watchers (WTW) each tripled and quadrupled despite very “mediocre” improvements in their business outlooks and results. The reason for the meteoric share price spikes was that both companies were highly levered and heavily shorted. Again, even just a very mediocre re-rate of their business prospects caused their share prices to triple and quadruple. Given the significant shift in the business prospects for Hertz, seeing the share price triple or quadruple should come as no surprise in the near future. This is why Icahn was more than happy to double down at $23. Shares of Hertz are now down by 90% in three years. The entire market cap of Hertz is now down to just $1.2 billion. Icahn already owns 35%. On July 31, Barclays put out an extremely bearish sell note on Hertz. But in reality, all the Barclays note did was simply amplify the bear thesis that had already been widely disseminated in the market for the past year. Barclays predicted that Hertz’s stock was due to fall by a further 50% from its then level of just under $18. In just two days, Hertz stock fell by 30% on 40 million shares of volume. 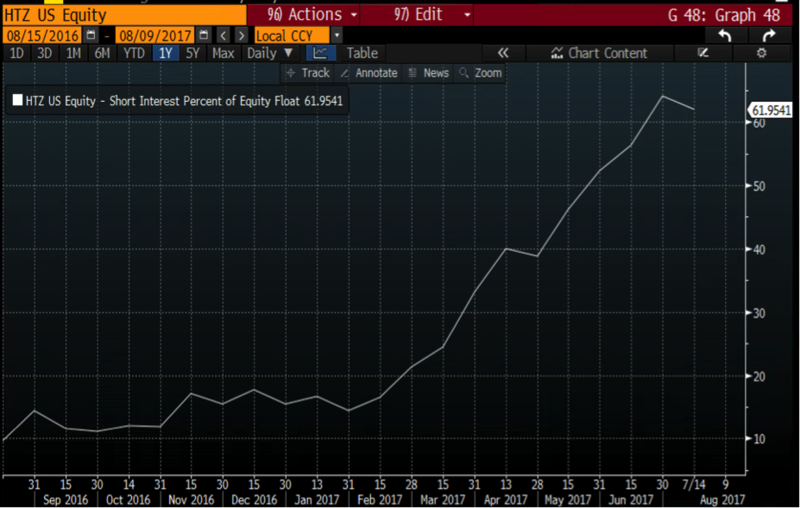 Short interest now stands at a staggering 62.0% of float. But suddenly, in just the past week, other sell side analysts began waking up to a new paradigm for the former “car rental” companies. These “rental companies” are now being re-cast as “fleet management” plays which are actually CRUCIALto the future ambitions of ride hailing (Uber/Lyft) and autonomous vehicles (Apple/Google). Hertz share price has been battered due to poor financial performance and negative sentiment towards the future. But this share price outlook could change sharply. As we have already seen, private companies like Uber and Lyft are being awarded PREMIUM valuations despite continued large financial losses. The only thing that matters is securing market dominance in this transportation gold rush. Once investors realize Hertz’s emerging positioning in this new market, its distressed valuation could easily flip to a premium valuation. The only thing that is really necessary is just a change of popular sentiment. Following the bullish report by JP Morgan last week, mainstream media outletsare now jumping on the bandwagon to hype the prospects of this new distributed transportation paradigm. A few weeks ago, this sort of positive attention on “car rental” companies was unthinkable. But now such attention is becoming popular. As Hertz transforms itself into a “fleet management” company, it will let other players (such as Uber, Lyft, Apple, Google) interact with the end passenger. Regardless who is booking the ride for the passenger, the passenger will still end up in a car that is ultimately supplied by Hertz. The transition into autonomous vehicles will only accelerate this trend. Not only will Hertz get to claw back revenues which would otherwise be lost, but it can also make drastically longer use of its car inventory. Since Uber and Lyft allow the use of much older cars, Hertz can greatly extend the life of its car inventory rather than repeatedly dumping 1-2 year old cars into a distressed used car market. 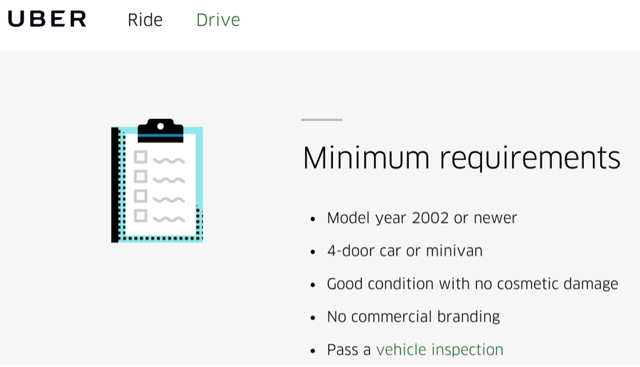 Requirements for Lyft vehicles vary by state, but range from as old as 2002-2007. On August 4th, JP Morgan revealed the first hint of the new investment paradigm from a sell side analyst. Despite his neutral rating on Hertz, the stock jumped 10% that day. Why? First, a future with fewer personally-owned vehicles means someone will have to own and manage this new ecosystem. JP Morgan notes that the gap between rental cars, ride share and autonomous vehicles is now shrinking, “making them one and the same”. Hertz already has in place programs to provide rental cars to both Uber and Lyft drivers. In fact, Icahn’s Lyft is now paying Hertz up to 90% of the cost of a rental for Lyft drivers when they meet minimum ride requirements. What this means is that a Lyft driver can use a Hertz car (rather than his own) at almost no cost. He gets unlimited miles, the insurance is included and he bears no cost of depreciation or maintenance. Here is the current offer being made to Lyft drivers. Keep in mind that Lyft is the one paying the fully agreed price to Hertz. Again, remember, Hertz is receiving the fully agreed price for the rentals above. The subsidy is being provided to the driver from Lyft. Ride hailing platforms are undeniably faster, easier, cheaper, more convenient and more flexible than renting a car. So until now, Icahn’s decision to double down on an imploding car rental chain was puzzling. After all, the consensus view on heavily shorted Hertz was that “car rental” is quickly going the way of the Yellow Pages and the printed newspaper. Ultimate failure was certainly viewed as a question of “when” not a question “if”. So why is Icahn so content with his current paper loss of $1 billion on Hertz? The answer is that $1 billion is actually a tiny price to pay for a controlling position in the new transportation paradigm. In just 2017 alone, Uber is on track to lose a staggering $3 billion. Eventual profitability for Uber is nowhere in sight. There are now many players vying for the future of how to transport people around. Giants like Apple, Google, Uber and Lyft have each been competing to throw BILLIONS of dollars into their transportation efforts with absolutely no need to make near term profits. Regardless of who eventually wins this transportation gold rush, Carl Icahn will be “selling shovels” to them all, winners and losers alike. Once you review the timeline of Icahn’s involvement in this space, this strategy becomes entirely obvious. 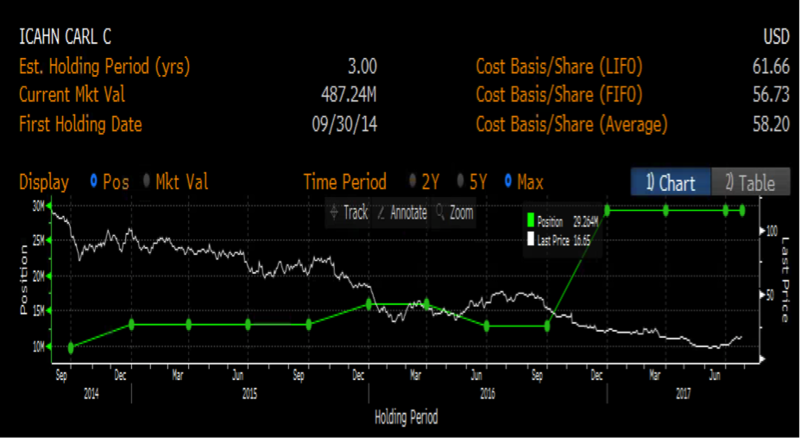 Icahn began investing in Hertz in 2014, when the share price was still over $100. In 3Q 2016, a steep earnings miss sent Hertz’s share price into a tailspin, plunging by 35% from its then level of $35. Icahn immediately bought 16 millionmore shares at an average of $23.78, more than doubling his total stake to 29.3 million shares. Icahn is now the largest shareholder of Hertz with a 35% stake. Both of Hertz’s bonds and shares have been under tremendous pressure for the past 3 years. Yet Icahn chose to double his stake in the EQUITY, while NOTbuying the BONDS. 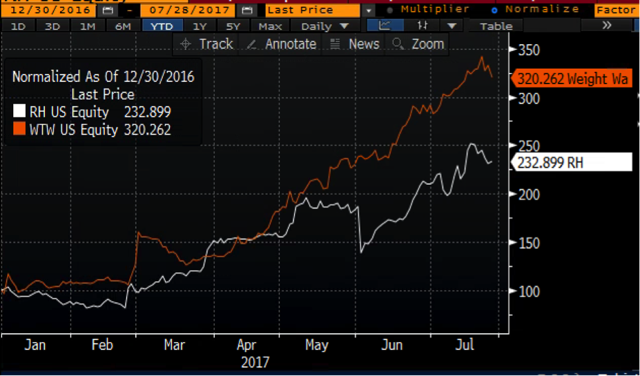 If Icahn had any concerns about bankruptcy he would quite obviously be moving up the cap structure away from the common stock and into the bonds. 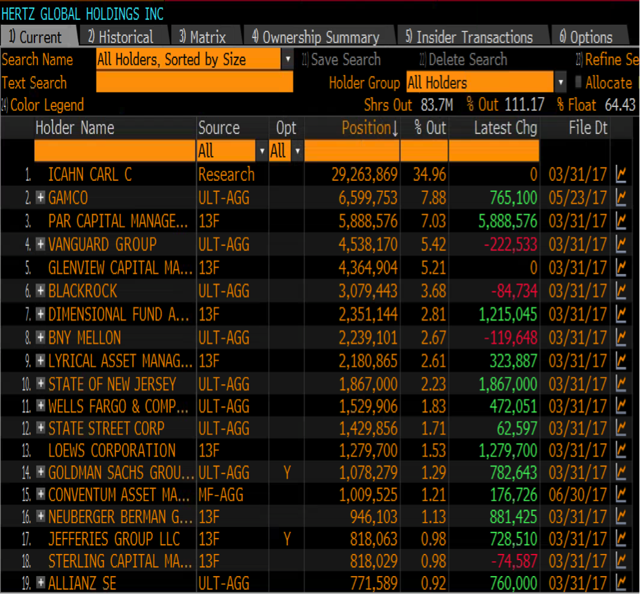 A search of bond holders on Bloomberg shows that Icahn is not a bond holder. In 2015 (after Icahn had already begun investing in Hertz), Icahn quickly invested $100 million into the ride hailing service Lyft. Icahn chose to take down fully 2/3 of that $150 million financing round in Lyft. Icahn demonstrated that he understands the new ride share dynamic completely. What I’m saying is there is a secular change going on with the way people are getting around, and with urbanization, it means more people living in urban areas. So as Icahn continues to ramp up his stake in Hertz, he is certainly NOT doing so because he is oblivious to the emerging dominance of ride hailing platforms. In fact, Icahn is investing in Hertz as a way to benefit from the rise of ride hailing platforms such as Uber and Lyft ! 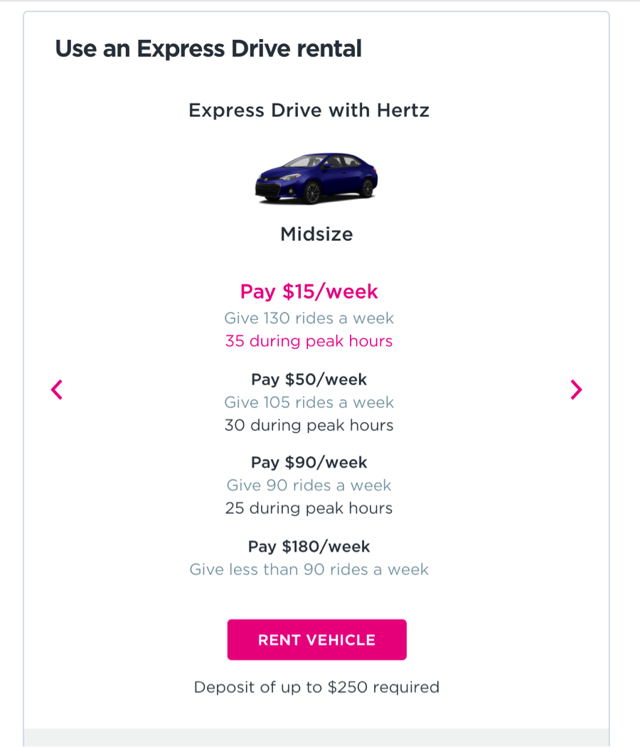 Shortly after Icahn invested in Lyft, Hertz and Lyft began teaming up, creating the above mentioned Express Drive program where Lyft pays to Hertz the cost for drivers to rent cars from Hertz rather than use their own cars. Hertz later began a program for renting to Uber drivers. Just two months ago (June 2017), Icahn acquired car-service chain Precision Auto. That deal added 250 locations to Icahn’s existing network of 1,000 car servicing shops. Carl Icahn is raising his bet that Americans won’t fix their own cars, and that eventually many might not even own one. And then just after that, Icahn announced that he was acquiring additional THOUSANDS of auto repair shops across the country. In fact, over the past 3 years, Icahn has been paying top dollar across the board to assemble together an interlocking network of automotive companies which will provide rental, ride share, parts, servicing and fleet management. 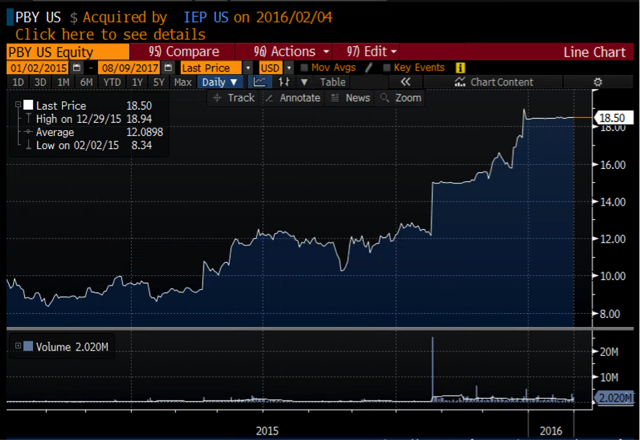 In early 2015, auto parts chain Pep Boys was trading at $8.00. The company was highly leveraged, heavily shorted and financially shaky. (It was quite similar in these respects to Hertz in 2017). 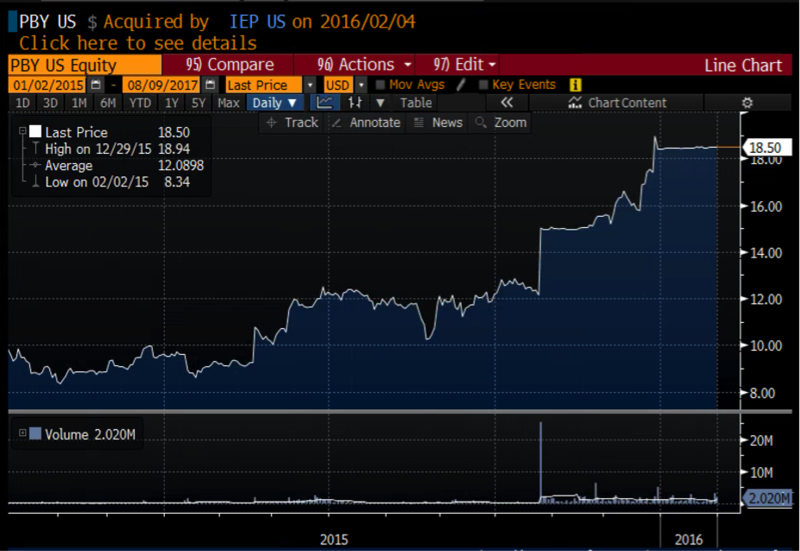 In December 2015, Icahn announced that he had acquired a 12% stake in Pep Boys. Just days later he made a bid for the entire company at $15.50 per share (up nearly 100%). A bidding war ensued with Icahn bidding against Japan tire company Bridgestone. Icahn was more than willing to outbid Bridgestone at $18.50 per share, valuing the company at over $1 billion (up 130% from just a few months earlier). On a standalone basis, most outside observers agreed (at the time) that Icahn significantly overpaid for Pep Boys. Here was the run-up in the stock leading into the eventual buyout by Icahn. It took a few months, but finally the media took a completely different view of Icahn’s purchase of Pep Boys. In 1H 2017, we saw shares of Restoration Hardware and Weight Watchers triple and quadruple from their lows to their highs. Both stocks were highly levered, heavily shorted and faced very visible challenges in terms of business prospects and valuation. In other words, in January 2017, each of Restoration Hardware and Weight Watchers was very similar to where Hertz is today. 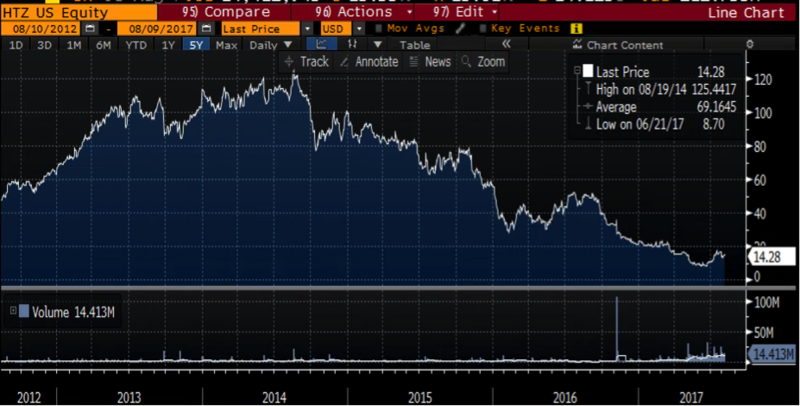 For each of Restoration Hardware and Weight Watchers, all it took was a very MEDIOCRE re-rating of their business prospects to see them triple and quadruple in just a few months. The meteoric rises of Restoration Hardware and Weight Watchers took everyone (especially short sellers) by complete surprise. The reason for these wildly disproportionate share price spikes lies in the leverage and the short interest. High leverage cuts both ways. It amplifies share price moves on the upside as well as the downside. When a mediocre re-rating of the business causes the enterprise value to rise by even just a moderate amount, the high leverage means that the equity value vaults higher by multiples. That is why we call it “leverage”. Based on the information above, Hertz is due for a truly transformational re-rating of its business prospects. While it was recently dismissed as a dinosaur business on its way to extinction, it is now being viewed as an absolutely critical component of the future of transportation. This certainly merits a more-than-mediocre rise in enterprise value. Hertz has a total of $16.8 billion in debt. But of this, $11.2 billion is debt secured by vehicles. The debt that really matters to us is the $5.6 billion of non-vehicle debt. What this means is that as investors re-rate Hertz business prospects, a mere 25% rise in enterprise value translates to a 127% rise in the share price to around $32. If investors decide that the new paradigm makes the business (enterprise value) worth double what the dinosaur was worth, then the share price should go up by 510% to $87. Clearly this is why Icahn is completely unperturbed showing a tiny little paper loss of just $1 billion . Against these tremendous upside prospects, it is now the case that there are more shares short than there are available shares to cover in the effective float. As the share price has fallen lower and lower, more and more bears have piled on at the bottom. The result is that short interest now stands at 33 million shares, which is 62.0% of the stated float (according to Bloomberg). But it actually gets worse than that. Much worse ! The already staggering 62.0% is the number reported by Bloomberg. But in reality, this number ignores the fact that several funds have initiated, maintained or increased their 5%+ positions and are unlikely to sell in the near term. As a result, these shares are unavailable when shorts are looking for shares to cover. Furthermore, index funds which own around 18% of Hertz are also unable to sell simply because the share price spikes. They must continue to hold in proportion to their benchmark index weights, regardless of where the share price goes. As a result, the effective float at Hertz is around 22.3 million shares vs. the short interest which now sits at 33 million shares. There are simply not enough readily available shares for shorts to cover. Here is the math behind the effective float. Icahn owns 35% of Hertz, which is already being factored in by Bloomberg. GAMCO. Recently increased its stake by 765,100 shares to a total position of 6.6 million shares. Par Capital. Just initiated a position of 5.9 million shares. Glenview. Maintained a position of 4.4 million shares. In total, these 3 funds own 16. 8 million shares that are not being sold, reducing the effective float, making it more difficult for shorts to cover. Index funds include Vanguard, Blackrock Dimensional and multiple others. In total, index funds own 14.7 million shares. Because they cannot readily sell, they further reduce the effective float, also making it more difficult to cover. Once we exclude the additional long term funds and index funds, there are only 22.3 million shares in the effective float which is well short of the 33.4 million shares which shorts need to cover. Here is the HDS screenshot from Bloomberg. Icahn’s play on Hertz is nearly identical to the play that Icahn is making on Herbalife (HLF), in which he is currently showing a profit of over half a billon dollars. Following significant negative exposure, Herbalife’s short interest spiked, even as the share price briefly plunged below $30. After multiple purchases starting from around $40, Icahn then began seeking permission for larger and larger stakes. In July 2016, Herbalife agreed to allow Icahn to go up to 34.99%. And then in October 2016, Icahn received approval from the FTC to take his stake up to 50%. In February of 2017, as the float was getting tighter and the stock was rising higher, Herbalife announced that it had authorized a share buyback of up to $1.5 billion. 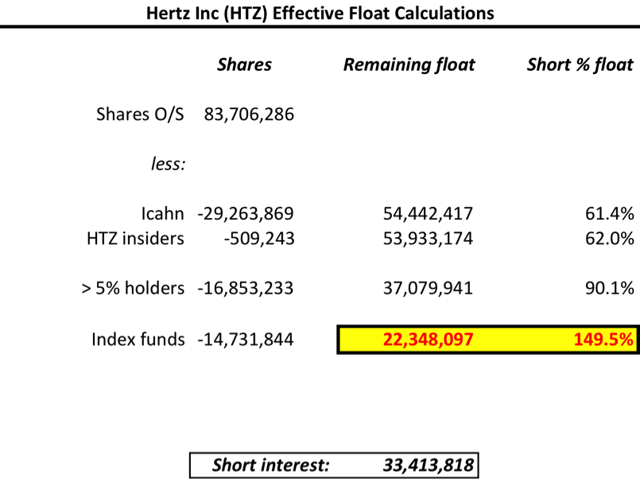 As it applies to Hertz, it is very clear that Icahn is well aware of the short vs. effective float dynamic. And as we saw in Herbalife, he is more than happy to use it to his advantage. Hertz currently appears quite levered, which has been of concern to investors. But remember that most of that is “vehicle debt” which is secured by the vehicles. Based on Icahn’s playbook with Herbalife, Icahn could conceivably buy more Hertz stock or use his meaningful presence on the board to encourage the company to authorize additional large share repurchase programs. In June 2016, Hertz announced a new share buyback authorization of $395 million. And then in November 2016, Icahn acquired over 16 million shares of Hertz at an average price of $23.79 for a total cost of over $388 million. This increased his total stake to over 29 million shares (i.e., 126% increase in his holdings). Disclosure: I am/we are long HTZ. Additional disclosure: The author is long HTZ. The author made make additional trades in the next 72 hours.